Elsa Schipaparelli's shoe hat of 1937-38 is the best known of the surrealist pieces made in collaboration with the artist Salvador Dali. 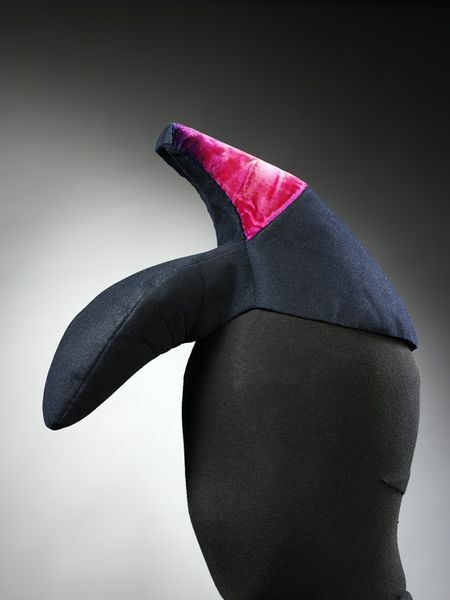 The hat derived from a drawing by Dali, which in turn evolved from a 1933 photograph Gala Dali took of her husband wearing a woman's shoe on his head and another on his right shoulder. Schiaparelli created her most directly surrealist works with Dali. This includes, in addition to the shoe hat design, the whimsical 'Tear' dress (T.393-1974) and the skeleton dress (T.394-1974) both dating from 1938 and now in the V&A's permanent collection. 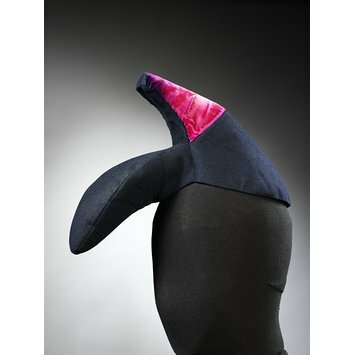 Hat of blue wool felt in the shape of a shoe, with fuchsia pink velvet heel. This hat belonged to Gala Dali and was inherited by her daughter Cecile Eluard. The Museum purchased it from a friend of Cecile Eluard, to whom it had been given.